26920 Montego Pointe Ct #102, Bonita Springs, FL.| MLS# 219003748 | Southwest Florida Residential Real Estate for Sale. NEW A/C being installed. Beautiful end unit carriage home with long paver driveway and 2 car garage. First floor unit with 2 bedrooms + den and 2 baths offered turnkey furnished with minimal exclusions. This home has a neutral decor with fresh interior painting, newer tile on the diagonal, newer refrigerator, newer tile on the backsplash and updated guest bath. The great room opens to the lanai overlooking a beautiful lake with wild life and lots of privacy for the homeowners and bright western exposure. The lanai has lucite sliding doors so that you can use the area year round or open the doors and let the fresh air in when you desire. The den is spacious enough to be a 3rd guest room. The master suite is separated from the guest bedroom for nice privacy. This is a very inviting and lovely condo in most desirable Bay Pointe w/in Bonita Bay. 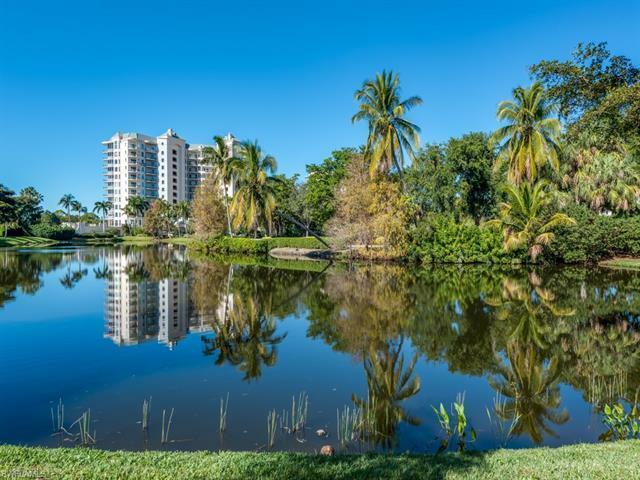 Enjoy the total lifestyle that not only this home offers, but Bonita Bay w/5 golf courses, private beach, marina, sports/racquet center w/ resort-style pool, lifestyle center w/ state-of-the-art fitness facility, luxury spa and salon, plus miles of walking & biking trails, & 3 parks.